Crate and Barrel Canada is recalling about 393 Holiday Bear Acrylic Milk Bottles. There are no reports of incidents or injuries to date. 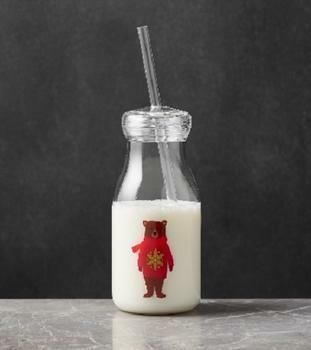 This recall involves the Crate and Barrel Holiday Bear Acrylic Milk Bottle (SKU 684364) which is a clear acrylic bottle measuring seven centimetres wide at the base and 14 centimetres high (20 centimetres with removable plastic straw). A graphic of a bear in a red sweater is printed on the wide part of the bottle. Consumers with questions may contact Crate and Barrel at (800) 451-8217 Monday through Friday from 8:00 am 8:00 pm (CT), Saturday and Sunday from 8:00 am 7:00 pm (CT) or online at https://www.crateandbarrel.ca/.